This coffee is exported a “Sidamo” in accordance with the Ethiopian Commodities Exchange (ECX) classification system. Under this system, all the coffee produced within the large Sidamo area is called “Sidamo Coffee”. In fact CCS “Sidamo” coffees are of the “GUJI Type”: a coffee that has a clear cardamon, black tea flavour, coming from producers whose farms are located at altitude ranges from 1770 (in Shekiso, for example) to 2100 metres. Guji is on the side of Gedeo and it is a very big area. CCS works with a private company (much coffee is sold through cooperatives) that purchases coffees through the ECX. Once coffee is purchased from auction, our partner hand sorts and prepares the green coffee to CCS quality specifications. As coffee is pulped, the sugars remain on the bean and these sugars are then fermented in water in fermentation tanks for a period spanning 48-76 hours, depending on the heat and altitude from where the coffee is delivered. 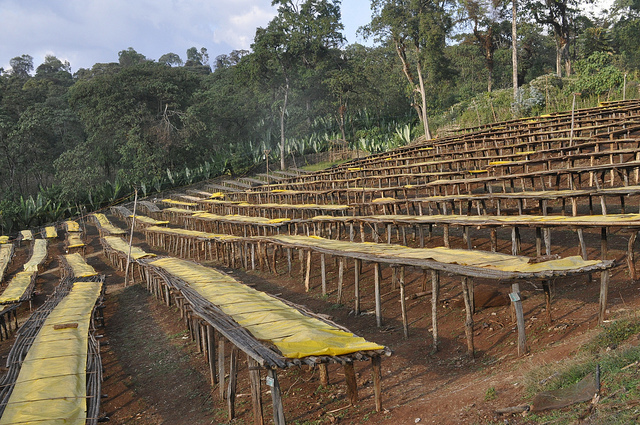 Once sugars are completely eliminated through the fermentation process the coffee moves under the sun for drying in parchment. The acidity of washed Ethiopian coffees is much more pronounced due to the fact that the sugars have been removed from the coffee. In contrast to the natural process, where sweetness is key, one can more clearly perceive the acidity in these washed coffees. Older PostCraft Coffee in Burundi?